REST is a software architecture style, commonly used for web services. Due to its popularity, you will probably need to load test RESTful APIs at some point. 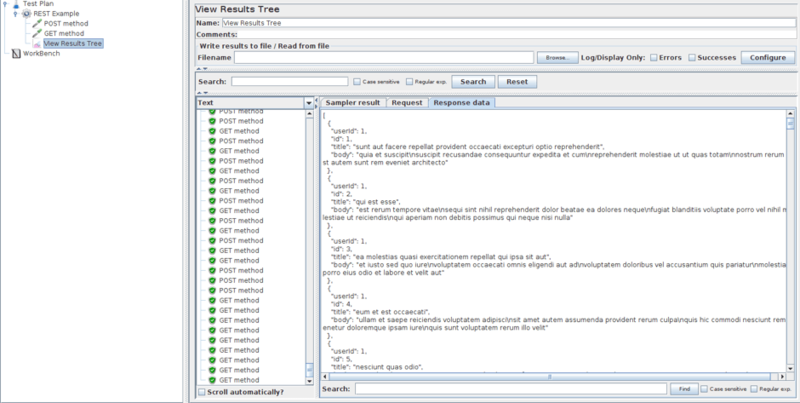 API testing can be done with Apache JMeter™. Read this blog post to find out how. REST (Representational State Transfer) is a software design pattern typically used for web applications. We can think about REST as a software architecture style. The basic idea of REST is treating objects on the server-side (e.g rows in a database table) as resources that can be created or destroyed. When we say RESTful APIs we are referring to the web services implementation of REST architecture. /articles - How a user accesses ALL posts. /articles/:id -How a user accesses and views an individual post which was retrieved based on their unique id. /articles/new How a form for creating a new post is displayed. RESTful API defines a set of functions that developers can use to perform requests and receive responses via HTTP protocol, such as GET, POST, PUT and DELETE. Sending a GET request to /users would retrieve the users from the database level. Sending a POST request to /users would create a new user on the database level. Sending a PUT request to /users/:id would update the attributes of a given user, again identified by a unique id. Sending a DELETE request to /users/:id would delete a given user, again identified by a unique id. 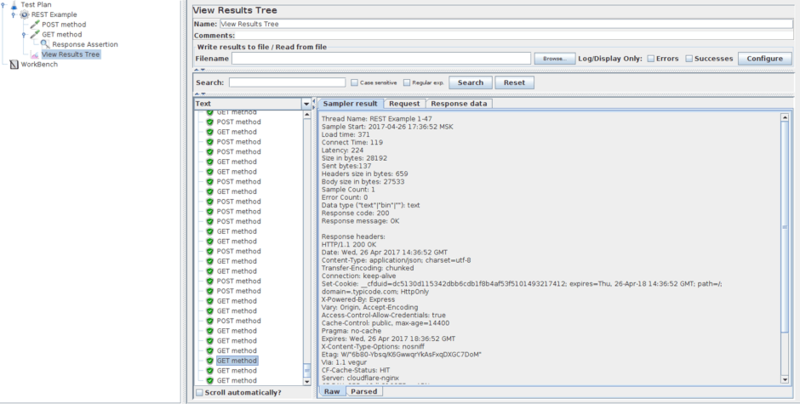 Load testing RESTful APIs can be easily done in JMeter with the HTTP Request Sampler. RESTful API available at jsonplaceholder.typicode.com. It’s very simple, but it’s enough for our work and for practicing. If you need to load test you need to add your own server’s name. Here we defined “Number of Threads = 50” and “Loop Count = 5”. This allows us to simulate 50 different requests for 5 times. I named the Thread Group “REST Example”. 2. Add a HTTP Request. Right Click on REST Example -> Add -> Sampler -> HTTP Request. 4. Set a Content-Type header. Important! Our RESTful API in this blog post is so simple that we do not need to send headers, and you can skip this step. But in other cases, this step is necessary. 5. Add a HTTP Request Sampler to our REST Example thread group. 7. Add a Listener to see the Request response. 10. If you need to verify that the post is presented in your received response, use the Response Assertion. 11. Leave this window’s settings as default. You only need to configure the “Patterns to Test” field, like below, according to the response you want to test. How does the Response Assertion work? In responses, different posts have different ids, titles and bodies. The response assertion looks through the whole response and looks for matches between the patterns you wrote down and what the response contains. If there is a match, the test will pass. If not - test will not pass. In this example I’ve taken the title of a post at our server. It is equal to “qui est esse”. Since there is a match, the test passes. Then you can see, that our GET method tests doesn’t pass. That’s it! You have now learned all the necessary information to create your own RESTful API tests. To learn more about performance testing with JMeter check out this free 5 day online JMeter training course. To learn about load testing with BlazeMeter, which enhances JMeter abilities, request a demo or put your URL or JMX file in the box below and your test will start in just minutes.